I promise you, though this sounds like a strange combination of ingredients, it is a FABULOUS dish and I love it so. Do you trust me? Will you try this recipe? I promise complete satisfaction, or your money back. This is for the cauliflower lovers in the house! The recipe has Sicilian roots and I once ate a similar dish at a Brooklyn restaurant and I never forgot it. Since then, I have seen cauliflower made a similar way, with raisins and nuts on Smitten Kitchen and it reminded me it was time to make this pasta dish again. In a large pot of salted boiling water, cook your cauliflower for 5 minutes (you can also roast the cauliflower for an even nuttier flavor, 450F for 25 minutes with kosher salt & olive oil). In a small skillet, add your fresh or panko breadcrumbs with enough olive oil to coat and some chopped garlic, and swirl around for 2-3 minutes until toasted and brown. Set crumbs aside. (*tip: I usually make a large quantity of fresh breadcrumbs by pulsing stale Italian bread slices in the food processor. They keep in a ziploc bag in the freezer for weeks, this way I have them on hand). Using the same pot of water that the cauliflower was cooked in, keep the water boiling and start cooking your pasta. You can make the sauce while your pasta is cooking. In a large skillet, enough to hold the pasta and sauce, heat some olive oil and saute the garlic & chopped onion until translucent, about 3 minutes. Now add the cooked cauliflower, raisins and pine nuts and cook for a few minutes, until the cauliflower starts to brown and get soft. At this point, you are almost finished. Add the chicken stock to moisten the ingredients in the pan along with the 2 tbsp of butter. Your pasta should be done by now, so drain it, reserving a cup of the pasta cooking liquid (this will thicken the sauce). Add the pasta right into the skillet w/ some of the water. 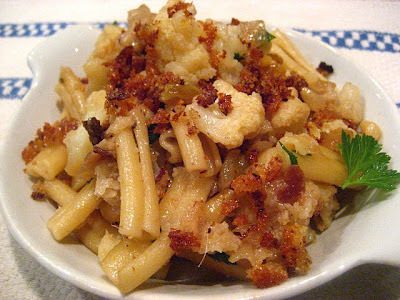 Toss the pasta with 3/4 of the toasted breadcrumbs, reserving the rest for serving. Add the capers and mix with the vegetable and pasta. Serve in individual bowls and garnish with fresh parsley and top each bowl with more toasted breadcrumbs. This took 20 minutes to throw together, and 2 minutes to inhale. PS I have no idea what that little white stringy thing is in the photo, so please don't ask! It does not sound strange, it sounds delicious. 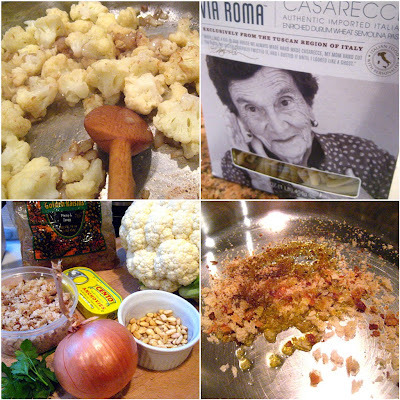 I made a pasta with cauliflower the other day, but not with the other Sicilian-inspired ingredients. Next time for sure. Not a strange combo at all! I saw the title and started yum yumming right away. I think it's fantastic and it looks even better! Definitely not strange - sounds enticing!! I love raisins and pine nuts. My ex's Sicilian Mother used that combination often. My recipe for sweet and sour meatballs have this combo and it's delicious. Yeah yeah yeah, looks yummy. But Im more facinated with what the little white stringy thing is!! I think the little white string is an anchovy bone. I have no pets and I don't have grey hair (well, maybe a few!). It does sound like a strange combo, but since you made it I bet it was fantastic. I have enough grey hair for both of us! I wouldn't have even noticed your anchovy bone, I was to busy gawking at everything else! Love cauliflower, I just cooked up some 2 days ago. Dang, this sounds good! I'm not crazy about pine nuts, but I bet some walnuts would be good in this, too. This doesn't sound weird to me at all, love cauliflower! There is a Sicilian restaurant in town that serves a salad with these flavors. It is essentially what you have here without the pasta and it is to DIE FOR. It's one of those dishes that has been on the menu since day one and they can't take it off because people would rebel. Now that I think about it, I wonder if it contains anchovies. Eeek! This sounds fantastic, all ingredients included! When you coming out this way again..? I need a Stacey fix! I am not a food blogger and therefore don't have a food site, but, I actually really made this recipe, and I can tell you that it not only looks and sounds wonderful, it IS. I used a little squeeze of anchovy paste because that's all I am brave enough to have within my household, and I added crushed red pepper because I add that to almost everything,and I don't really like raisins unless they are cut up, but the sweet, salt thing that all of you are always talk about works! And.. I love meat and all that stuff but I really love creative vegetable sides and let me tell you. MAKE THIS!! !